When you’re a tall girl, there are a lot of fashion rules you’re supposed to abide by. Mini skirts? Too mini for you. High-waisted pants? Not unless you want to look like you’re all legs and no torso. 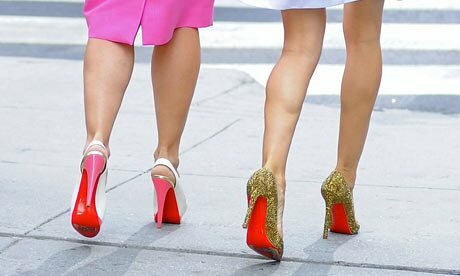 The list goes on and on, but if you’re above 5’7″ there’s one rule that haunts you more than any other: Don’t wear high heels. Unless, you know, you’re an actual supermodel. In theory, the “no heels” thing makes sense — you’re already tall, why would you want to tower over everyone you meet? Plus, they’re not the most comfortable, and it’s not like you need them. The truth is that no one does, but when you’re tall, you hear this enough that you start to believe it. I’ve been 5’9″ since before I even turned 12, and growing up I was almost always the tallest girl in my class. I never saw my lankiness as an asset. I wanted so badly to see myself like the models I saw in magazines and on TV, knowing that they too shared my otherness, but I always thought they were too pretty and their lifestyles were too unattainable for me to identify with as an awkward tween. Instead, I saw my height as the thing that literally made me stand out in every classroom. And for me, standing out wasn’t an something I wanted to do — I was bullied from the time I started school as a 5-year-old, and it continued relentlessly until I graduated high school. If there were ever a good reason to wish you could shrink yourself down into nothingness, being bullied was it. I was never harassed because I was tall, but my height meant that I couldn’t hide. When I was younger, I didn’t notice just how much I stood out. I wore things like platform sneakers and sandals (both tragically trendy in the late ’90s and early aughts) because I liked them and because I was blissfully unaware of the tall girl rules. But as I got older and started have new insecurities, I found myself in flats, slouching — I was trying to go through life undetected. I’ve always had a weakness for cute shoes, so I would impulsively pick out high-heeled boots and wedges when my mother took me shopping, but I’d often end up leaving them in my closet later, loved but mostly unworn. Sometimes I’d wear them to school, but I never felt good about it. I’d still slouch and try to hide, which didn’t help. I still don’t know what sparked the change in me, but when I was 16 I decided to push myself out of my comfort zone. 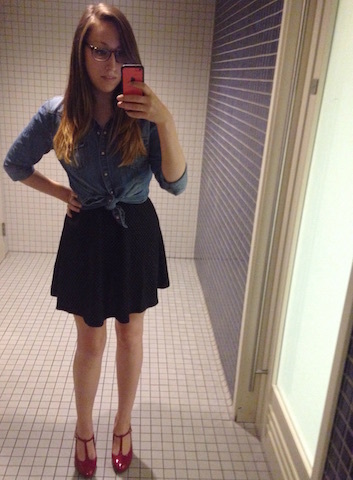 I started wearing high heels to school every day, forcing myself to stand up straight and tall. I became hyper-aware of my posture, walking with a “fake it ’til you make it” kind of confidence I didn’t even know I could have. Sometimes, the girls in my class would tell me boys wouldn’t date me if I kept wearing heels all the time. Before, that would’ve bothered me, but I quickly learned to laugh it off. The more I wore my heels, the less I cared about what other people thought. All that mattered was that I felt good about myself. Of course, I still had good days and bad. It took me years afterwards to fully embrace my height. But once I got comfortable in my heels, I slowly started breaking the rest of the rules more often, donning short shorts and mini skirts and high-waisted everything, until I realized all of those fashion “don’ts” were the things I needed to accept my body and see my own beauty. I used to think that wearing things like heels and short dresses and crop tops — all the things I now love and wear regularly — would emphasize all the wrong things about me because they weren’t flattering. Now, more than a decade later, I’ve finally learned something really important: The most flattering thing you can wear is self-love. The rules are all made up anyway.